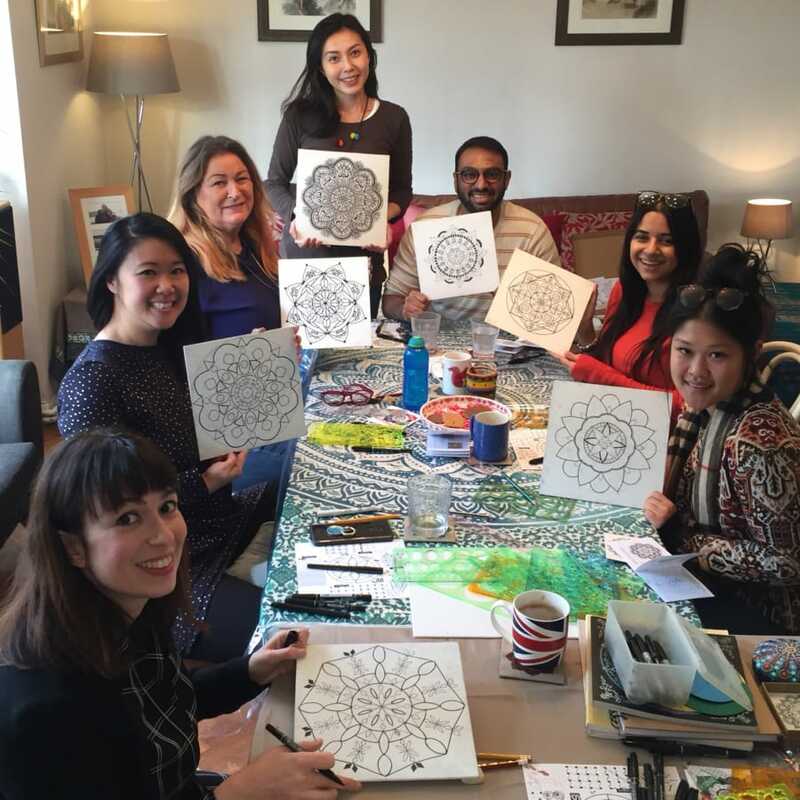 Learn to Draw & Paint your own beautiful Mandala! Mandala is a Sanskrit word meaning the circle and reflects the universe and everything in it! Mandalas are beautiful symmetrical creations that can be as intricate as you wish. Many of Ubie's students say they could never draw something as apparently difficult. But... you can !! You just need to know the tips and tricks of how and therefore the course is suitable for all levels of ability! Your completed work on either 25cmx25cm canvas or on high-quality watercolour paper that will be suitable for framing. These classes are intended to be a mindful and creative experience, so we expect you’ll leave the classes with a sense of achievement and a bigger smile than you walked in with. 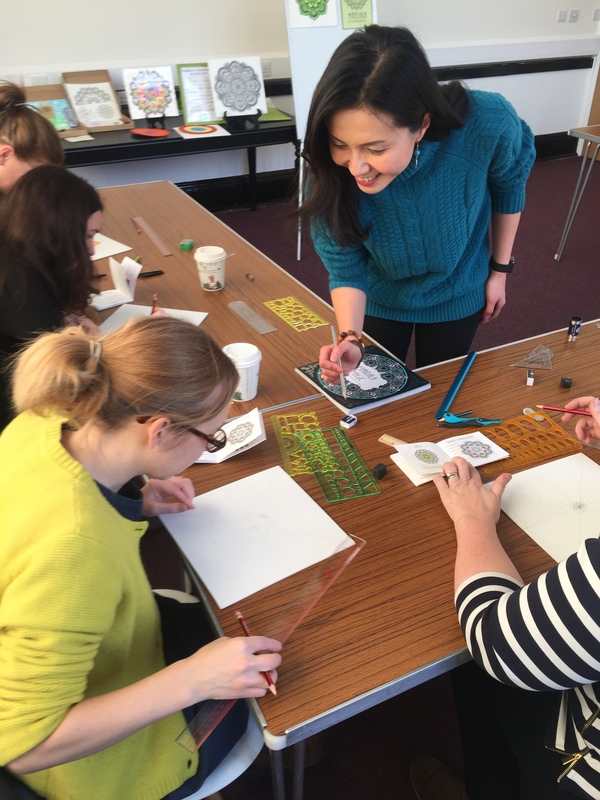 Thank you for such a lovely class - it made for a really absorbing day out, and it was great to bring home a finished piece completed during the day. I liked the fact that we dived in straight away with expert help all along the way if we got stuck. Venue was perfect and one day was just right to get enough practise to continue at home. This was a totally new discipline for me. Although I don't consider myself an artist I loved the symmetry of designing my Mandala. Ubie was very patient and excellent at guiding my choices of pattern and colour. The time flew by! 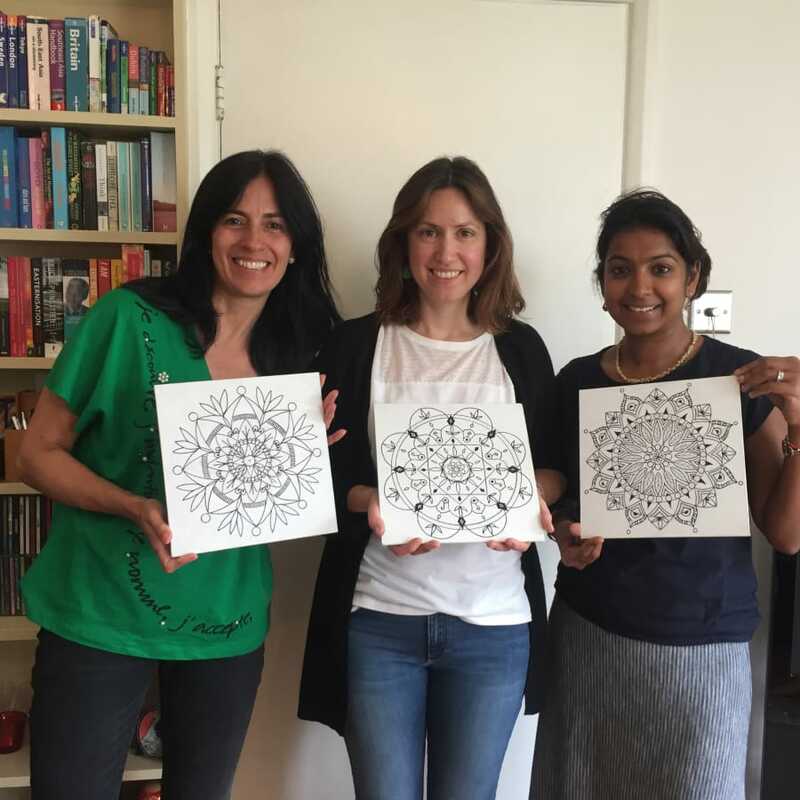 Perfect for learning the skills to draw mandalas. A good range of materials were provided, including the tools needed and lots of examples, including books. The environment was relaxed, friendly and uncompetitive. I participated in a full-day drawing and watercolour painting workshop. It took me 2 hours to get there but it was worth it! The group was small which was great because everyone received indyvidual attention and support from Ubie. 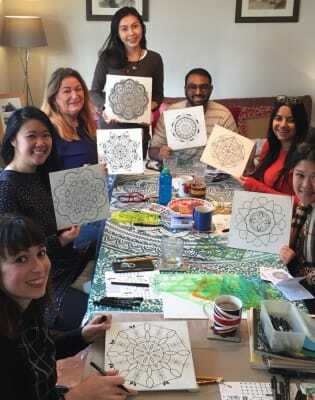 It was an absolutely new experience for me and I received step by step guidance of drawing and painting mandala. Ubie and Matt are super patient and enthusiastic and we had a very nice chat :) It was a very satysfying day and I am really pleased with my mandala :) I would definitely recommend doing this workshop with Ubie and Matt! I had a great time drawing my first own mandala and then paint one. It was really relaxing and Ubie and her husband were very welcoming and lovely people. The music was really relaxing too. There was a lot of help and testing and tea. Thank you Ubie and Matt. Thank you Ubie for an amazing day drawing and painting. You made it all so easy. I was amazed at what I produced at the end of the day. I attended the drawing and painting class and was initially unsure about whether it would be too long of a day. I was pleasantly surprised that by the end, I was still wanting to draw and paint! The time flies very quickly, as you are in such a comfortable and encouraging setting. The class is small and in a space that gives you a lot of attention and guidance. Ubie and Matt are very friendly and welcoming, and this made the experience even more enjoyable, as the environment is positive and uplifting. I left with a greater sense and appreciation of art, but more importantly, a desire to continue with drawing and painting. I look forward to attending more of Ubie's classes and highly recommend trying it, even if you have never taken any art classes. Just show up with an open mind and eagerness to learn! I had a lovely day learning how to draw mandalas in the morning and then learning about colour theory and painting my mandala in the afternoon. Ubie is a great teacher, very patient and explains things very well. There was also a lovely calm and welcoming atmosphere and Ubie and Matt were excellent hosts. I will be booking onto more courses as I had such a lovely day. Thank you both. It was a lovely and fun class. Ubie made everything fun and personable and Matt is the friendliest host. Relaxing environment with a great deal of fun and art work to take away with. Ubie provides the highest quality of art supply during the class which was a treat.